This inventive, locking tablet stand gives you unbeatable anti-theft protection plus expansive angle adjustment options. Optimized for space-saving, the stand can fold nearly flat against your countertop surface or wall, or adjust to a fully upright position. 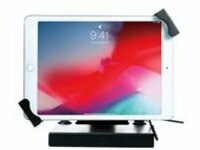 The sturdy metal neck features a pair of flexible hinges, while the tablet holder is outfitted with 360 degree rotation for easy portrait and landscape displays. The holder also offers a powerful lock and key security system plus a galvanized steel security cable that attaches to the stand's base or the back of the holder. The padded stand base can be mounted to your countertop with included hardware.